Klimt’s “Portrait of Adele Bloch-Bauer I” is certainly beautiful. It features a doe-eyed woman surrounded by and enclosed in gold, her hands clasped together awkwardly as if to avoid dirtying her glowing drapery. 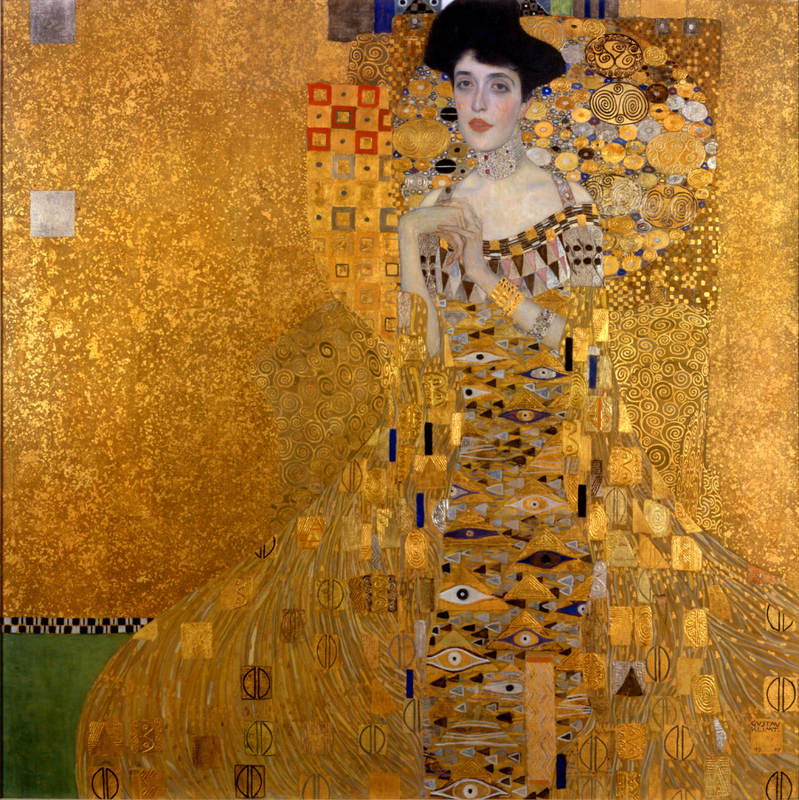 It is the central painting of the new exhibition, “The Woman in Gold” at the Neue gallery on the Upper East Side. The exhibition explores the relationship between Gustav Klimt and Adele-Bloch Bauer, the muse, the Golden woman. The exhibition coincides with the release of a movie under the same name, in which Helen Mirren plays the niece of Adele-Bloch Bauer, who was reunited with the painting after a long legal battle. The movie is a simple, soppy tale of a spirited old woman taking back what belongs to her. Maria Altman, the muse’s niece (the wonderful Helen Mirren), wants the painting of her aunt that was seized by the Nazis back in her family. She employs the help of a handsome younger fellow, played by Ryan Reynolds in glasses. Together they beat the odds and the painting is put in her legal ownership. It’s a little disappointing that such a glowing painting could be made the centre of such a bland movie (as much as I love Helen Mirren). The fascinating story behind the painting’s fame, too, is made bland and palatable by the movie. We might even say it’s carefully covered up. Although the painting never belonged to Adele, the beautiful muse, she asked in her will that it be given to Austria. But her husband, who commissioned it and another (Portrait of Adele Bloch-Bauer II, which makes the first seem garish) as a sort of status symbol, fled to Switzerland in 1938 during the annexation of Austria by Nazi Germany. The government took the abandoned property. The painting went to the Austria museum, where it glittered opposite an equally famous and equally golden painting of Klimt’s, The Kiss. Flash-forward much later to the niece, Maria, who as an old woman wants the painting back, on the grounds that Adele’s husband left the entire estate to his family in his will. After a long, ten-year struggle, the niece wins the case and receives the painting and a few others. This is the bit recapped in the movie; a tearful and beautiful reunion with a piece of family history, brought to the land of the free. So why is the painting in the Neue Galerie? Immediately after the Supreme Court ruling in 2006 the niece sold the painting at a record price, 135 million dollars, to Estée Lauder’s son, who happens to own it. Ronald Lauder (that is his real name) also happens to be the former U.S. ambassador of Austria. In a rapturous statement, he called the painting “our Mona Lisa.” (He then quickly corrected it to “everyone’s Mona Lisa,” but the initial statement rings a little more truly to me). Whoever the “our” refers to in his statement, it’s an interesting experience to see the painting in New York, and the painting in real life is much less one-note. The comparison to the Mona Lisa is apt; both paintings are extraordinarily famous, and I’m not sure either deserves to be. I’m also not sure if the painting should be here. But “The Woman in Gold” exhibition and movie do a good job of covering up some interesting stories in their careful American presentation of a this expensive painting. The exhibition features more than just the golden Mona Lisa: in a cute flourish, one wall is filled with colourful children’s drawings interpreting Adele and the painting (some of them are more interesting than the portrait itself). There’s also some display cases with jewellery from Vienna, intended to ‘give us a sense of Adele’s world’. I can’t help but wonder if I would be getting a better sense of her world if I were seeing the Golden Woman in Vienna, where Adele desired for it to stay.